You must be a member of the New Delhi Women's Fun, Adventure & Travel Group to attend this activity. Would you like to join this group? Sorry, but this is a women only Activity Group! We are afraid that you cannot join this group. The Consuls have limited access to women only. It is often said that quick getaways on the weekend are the best way to get refreshed and rejuvenated from the daily tension of your workplace. It will help you divert your mind and bring change into your monotonous work schedule. A quiet little hamlet set in the backdrop of lush green fields and whispering winds, Pratapgarh is the perfect getaway destination for you to experience the real rural India. 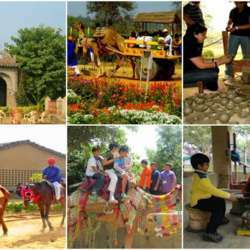 Along with this, they have amazing fun activities like Camel ride, Camel cart ride, tractor ride, etc, you can also perform the Dholki dance on the traditional folk songs of Rajasthan. And don’t forget to enjoy the mud bath continued by a proper cleansing under a tube-well. Setting the same standard for their food, they provide you farm to table experience. Their food menu ranges from Tandoori Roti, Dal Makhni to Gajjar & Moong ka Halwa.